Their relationship is taking off. 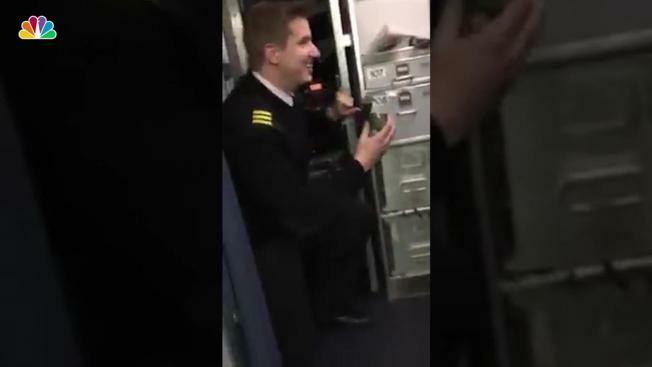 A SkyWest flight attendant had a surprise announcement to add to his in-flight message to passengers aboard a flight to Oklahoma City last week. Jon Emerson started off with the usual information, advising about the weather and flight time. But as he introduced the SkyWest staff aboard the plane, he brought out his girlfriend Lauren Michele Gibbs, also a flight attendant. He told passengers that it was their anniversary, but that the day would also be special for other reasons Gibbs wasn't yet aware of. At that moment he puts down the PA device, bends down on one knee and proposes to Gibbs. She said yes. A video of the sky-high proposal was posted on Facebook and now has more than 100,000 views. "Last night, on a plane, in front of passengers, I got to say the easiest YES of my life to my best friend! It still feels like a dream and I cannot explain how blessed I am to spend forever with Jon," Gibbs posted. "We are so thankful for our family and friends, and especially thankful for God leading (or flying) us to each other. Sorry to disappoint, but the wedding will not be on a plane!" She added the hashtag '#LaurenLandedEmerson'.